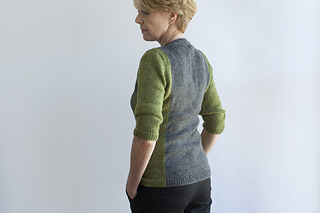 Have extra stash in some colors but not enough for a whole sweater? Try Alice – a figure flattering, color-block pullover with v-neckline and just-below-elbow length sleeves. Worked in stockinette stitch overall and trimmed with 1x1 rib, gentle shaping occurs along the edges of the center panels. 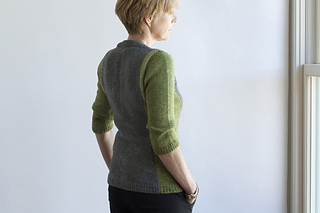 Side panels are worked evenly with waist ribbing positioned to match the even waist knitting of the center panels. Alice’s modular components make this a fun, take-along-anywhere project. Piece is worked bottom-up with seams and sleeves are set in. – CC (side bodice and sleeves) Turtle #2452; 4, 4, 5, 5, 6, 6, 7 skeins, or for comparable yarn, approximately 535, 605, 705, 800, 900, 1000, 1125 yards. Techniques: knit, purl, k2tog, k2tog tbl, p2tog, p2tog tbl, m1r, m1l, stitch pick up around neckline, blocking, and seaming.